Soooooo, this morning I was getting ready for a conference call with the guys I contract with and suddenly there was a loud crack, then static, then silence, and the TV screen was blank. 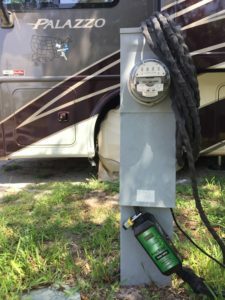 My initial thought was that a power spike had come in through the campground TV cable since everything else seemed fine. I switched the TV over to AppleTV and it worked fine. Then I noticed that our WiFiRanger had automatically switched us from the campground WiFi to our backup Verizon MiFi hotspot. This confirmed to me that the campground must have taken a hit through their TV cable and it had also brought down their WiFi. This incredible machine we’re living in, Freya, had tricked me. It turns out, it wasn’t just the TV and WiFi, but the campground’s power was out during my entire meeting and I never even knew it. I checked the control panel and only then did I realize we had no power. Freya’s inverter had kicked on and was powering the entire coach. Well, everything except the air conditioners. I love it when things work so well you don’t even know they’re working.